The first joint project to help farmers use existing irrigation water to generate electricity has been completed in Colorado. And the Colorado Department of Agriculture is looking for more producers who want to try it. The installation, near Hotchkiss, Colorado, is the first for the multi-agency Pressurized Irrigation Small Hydropower Partnership Project, which is part of the U.S. Department of Agriculture's Natural Resources Conservation Service's (NRCS) Regional Conservation Partnership Program (RCPP). During the next few years, the program is expected to create 30 on-farm hydropower projects in Colorado. The Hotchkiss installation helps veterinarian and farmer Susan Raymond use water already flowing in her irrigation pipeline to generate electricity to offset that used by her veterinary practice and alfalfa operation. 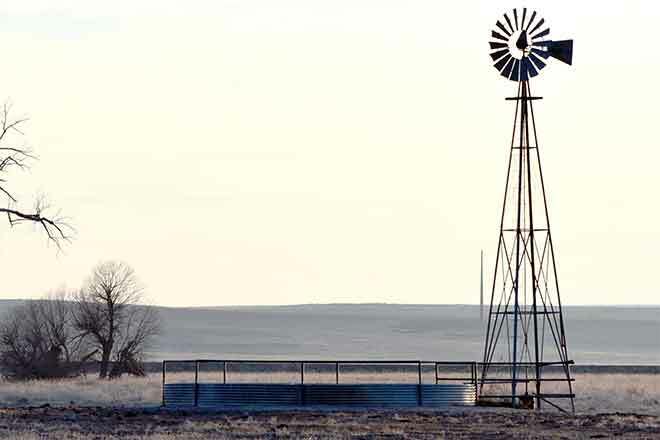 When the water is not being used to feed her three center-pivot sprinklers, it flows through the 8-kilowatt hydropower generator attached to the pipeline. The $50,000 project was finished in early July with $32,800 in assistance from four funding programs, including the Colorado Department of Agriculture's "Advancing Colorado's Renewable Energy and Energy Efficiency" (ACRE3) program, the NRCS' Environmental Quality Incentives Program (EQIP) and Rural Development's (RD) Rural Energy for America Program (REAP), and the Delta Conservation District. The project also used local contractors. A second Colorado project is under construction near Kersey, Colorado, to help a farmer there use the energy in his irrigation water to generate electricity. That will help offset the electrical bill for his farm. That project uses "low-head" hypropower technology because the available pressure in the surface-fed water is lower, as is the case with many agricultural water supplies. The Colorado Department of Agriculture is looking for more producers who want to participate. Sam Anderson, the department's lead official for the hydro program, said the department will help producers apply to the funding programs. Applicants must be eligible to receive funding from the EQIP program. To start the application process, contact Anderson at sam.anderson@state.co.us.